Containment Pond Cleaning | GeoForm International Inc. Containment ponds serve the essential purpose of preventing waste water from contaminating streams or surface water — you’ll find them at chemical plants, farms, mines and various industrial operations. Over time, containment ponds can become filled with sediment and debris that settles to the bottom, which can reduce water volume and present a long list of environmental hazards. Dredging is the most commonly applied containment pond cleaning method. Manual sediment removal entails draining the pond, flattening the dried sediment with a bulldozer and refilling the pond. Using a mechanized dredging system is more efficient than this manual process and involves the use of specialized equipment to suction the muck from the pond bed — much like a vacuum suctions dirt from a floor or carpet. 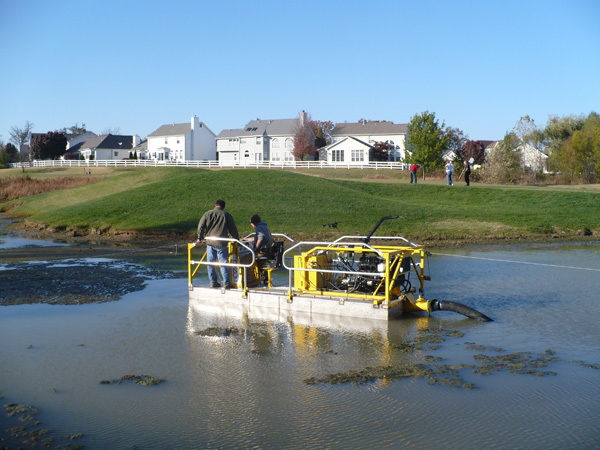 Aeration can complement dredging or be used as a stand-alone cleaning method for smaller ponds. Aeration circulates the water and provides an influx of oxygen into the muck that promotes its decomposition. Aeration is typically less expensive than dredging. Whether you need a dredge or aerator for containment pond cleaning, you’ll find the best equipment at GeoForm International. Our lightweight, compact Dino6 is perfect for all types of containment pond cleaning applications, and we also offer efficient aerators that will get the job done for smaller ponds. Contact us for more information on our customizable dredges today! "Everyone at GeoForm International was very patient and knowledgeable. I researched the Dino6 extensively and had lots of questions that Richard was more than willing to spend time to answer. They were very welcoming when I visited their facility as well."